All six Adams athletes on signing day. Many proud moments occurred at Rochester Adams High School when on National Signing Day six students made their decision about where to play college sports. Among the students who signed the morning of Wednesday, February 7, was Vincent Gray, who is going to play football for The University of Michigan. Along with Cole Patritto and Steven Roncelli who will be playing football, Hailey Wentzloff who is playing soccer, all signed with Grand Valley State University. Ben Champine will be playing soccer for Western Michigan, and Will Wardle signed to play soccer for Rochester College. 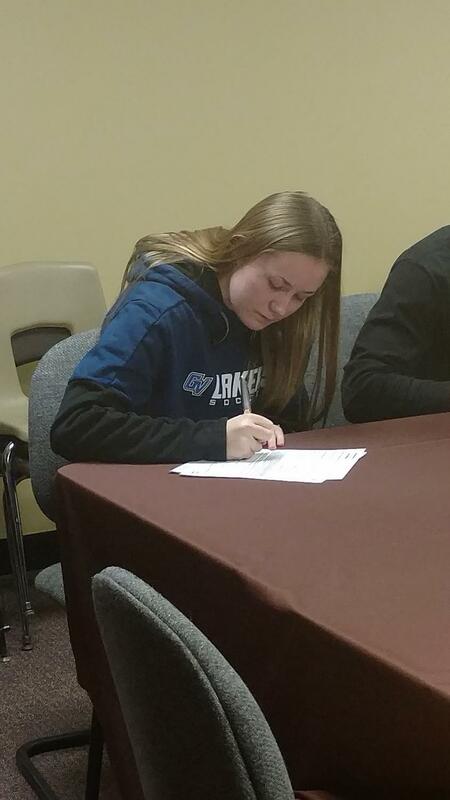 Hailey Wentzloff signing with Grand Valley State University to play soccer. Excitement was in the air that morning, as family members and coaches came to support the athletes and show how proud they were of their children now competing at a collegiate level. Of the parents that showed to see their kids, none were prouder than teacher and coach Mr. Anthony Patritto. Not only was he proud of seeing his players sign and move on to play college sports, but also he was proud of his son, Cole Patritto. “I was really proud such a small percentage of high school students get a chance to play college football at that level; incredibly proud of what he did,” said Patritto. As a school, Adams is proud of its athletes and their ability to make it as far as they did. Adams wishes them the best and hopes they play strong throughout their new journey ahead of them.